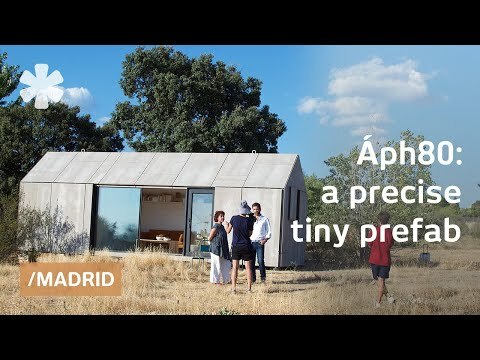 ÁBATON has developed the ÁPH80 series as a dwelling ideal for 2 people, easily transported by road and ready to be placed almost anywhere. The proportions are the result of a thorough study by our architects' team so that the different spaces are recognizable and the feeling indoors is one of fullness. It is a simple yet sturdy construction made of materials chosen to provide both comfort and balance. ÁPH80 embodies the principles and objectives of ÁBATON: wellbeing, environmental balance, and simplicity. ÁPH80 has 3 different spaces measuring 27 sq mt (9x3): a living-room/kitchen, a full bathroom and double bedroom. Its gabled roof is 3,5mts high indoors. Most of the materials can be recycled and meet the sustainable criteria that ÁBATON applies to all its projects. It blends in with the environment thanks to its large openings that bring the outdoors inside. The use of wood throughout the building not only adds calmness and balance but it is also hypoallergenic. The sourced wood comes from regulated forests (will regrow to provide a wide range of other benefits such as further carbon storage, oxygen generation and forest habitat). Technical Data: The outside is covered with grey cement wood board. Ventilated façade with 12cm thermal insulation around the building. Solid timber structure manufactured through numerical control; Inside timber panels made of Spanish Fir Tree dyed white. ÁPH80 has been designed and manufactured fully in Spain. APH is delivered in one piece. Water, electricity and plumbing installations can be connected in few work steps at the site. The ideal would be that the connections were already executed prior to the APH delivery. In case there are no connections in the site ÁBATON can provide self-sufficient solutions. APH can be installed almost everywhere as long as there is enough space for a flat bed truck and a crane We only need 8 concrete cubic foundations to lay the house. A crane with minimum power of 8 tons is required. Generally an application for installing the APH80 is required -at least in Spain- The process of approval is different from country to country and from town to town. That is why it is necessary to consult the local authorities. For the production of a APH mostly certificated and ecologically flawless, that means healthy, pollutant-free materials with using resources economically. The outside is covered with grey cement wood board. Ventilated façade with 12cm thermal insulation around the building. Solid timber structure manufactured through numerical control; inside timber panels made of Spanish Fir Tree dyed white. For security reasons we use anti-burglar glazing. Furthermore, the outer wood cement board shutters clad the house in full. APH glazing are low emissivity (E-low), tripled with double cavity wall, with a 1,4W (m2K) heat transmission only. The APH has a 12 cm high density insulation all around. The life expectancy of an APH is comparable to conventional houses, with regular maintenance. Due to a high quality material usage, some parts have even longer life expectancy. The possibilities of the usage of any APH are nearly infinite. As a guesthouse, relaxation room, sport room for your garden, as an office or presentation room and atelier or as a mobile holiday house at the seaside. An APH can futhermore be placed outside the city using it as a relaxation, sport and weeekend house. The interior height of an APH is of 2,50 at its highest point, and of 2,00mt at its lowest. APH is transported on a lorry and is lifted on the ground by a suitable crane on the foundations. The crane must have a minimum power of 8 tons.